Which direction do you want to take with your studies? What do you want to do after finishing your studies? What do you want to study? Or do you prefer looking for a job? Do you want to go abroad? Do you want to start your own business? But… What do YOU want? What do you really want to do? With whom? Why? Which is the path you build for yourself? Which choices do you make? What is inside of you that wants to express itself? To find the answer to all these questions, you need a good insight into your strengths, your values, your dreams, your longings, your ambitions, … In short, a strong inner compass that indicates the direction in which your life path could take you. School education does not support you to develop this inner compass. This is the place where you have probably often heard what you are not good at and should put more effort into. But what is it that you excel in, in such a way that it could fill the rest of your life? What does your life project look like? Your Wheel of Choice® can help you make all these choices. It is a gift for life! Do you want to get started to develop your own Wheel of Choice ®? Contact one of our coaches in your neighbourhood. As young adolescents, we take a lot of important decisions that will steer our life in a certain direction. After a decade or so of working and having spent time as a more mature grown-up, we start having doubts and get frustrated. At that time in our lives we start to feel the consequences of the choices we made: does this job suit me? Am I leading the life that I want to lead? Am I focusing too much on my competencies instead of my interests? People who deviate too far from their inner course or destination will end up in an existential crisis. The Career cheque of the Flemish Government (www.vdab.be/loopbaancheque) makes it possible, along with a career coach, to investigate what really excites you and what your personal career goals are. Your inner self often knows what it wants, but you are no longer well connected with this part of your being. Our rational thinking is far more developed than understanding our feelings. My Future Works is our partner for career coaching. After all, the coaches of My future Works all work from the same frames. Find your career coach in your neighbourhood via www.myfutureworks.be. Would you like more self-management within your organization? Organizations realize that the "command and control" organization models that proved to be effective in the past, are preventing them from handle the future macro-economic challenges in a sufficient manner. That is why many organisations experiment with new types of organisation structures based on trust, empowerment, self-management, etc. Because the known frames of reference are fading, people need to be able to rely on their inner compass which must be aligned to that of the organisation. The development of our inner compass often gets very little attention during our education. The Wheel of Choice® can help to fill this void. By becoming aware of our strengths, values, goals and ambitions, we can sail the seas of an increasingly self-managing and connected world. Do you want to invest to develop the resilience of your co-workers? The complexity of our organisations and our world make work more and more complex. Many people are running empty, and stress and burn out are lurking just around the corner. The extend in which people manage pressure with a good amount of resilience is determined by the extend in which they are connected with their inner compass. After all, this compass helps them to make choices about what is and what is not beneficial for them, and, where appropriate, to set boundaries. The Wheel of Choice ® is the first instrument on the Belgian market that helps people to make conscious choices directed by the inner compass. It is very efficient to use as a prevention tool in stress- en burnout programmes. Which choices do you want to make about learning and development? Our world is transforming from a linear to a connected one. Predictability is a thing of the past. 60% of all professions we know today will no longer exist in 20 years. Today 100000 students are enrolled in a programme that is no longer relevant in the employment market. Changes in our surrounding world occur at the speed of light. Digital is the new normal. Learning happens in the cloud. Hierarchy is replaced by self-management. Learning and development are at the heart of Agile organizations. The Wheel of Choice ® helps your employees to create a sustainable development plan aligned to their strengths, their values and their ambitions. It helps to identify what is needed to develop their potential to Olympic levels. It makes the yearly performance appraisals so much richer, because they focus on learning- and development plans created from the inside out. How is it that some people whistle on their way to work, while others count the minutes and rush to the time clock at 5 pm? What is the difference between motivation and mustivation? Do people perform jobs that are aligned with their personal ambitions, dreams and longings, or do they just do the job because they must? The Wheel of Choice ® uncovers the essence of personal motivation. Why do people do the things they do? In the light of this, work is put in a very different perspective. When we start to discuss and discover what really moves us, authentic connections are established between people, in which they work together to achieve a common goal everyone beliefs in. Do you want to build your teams and organisation around fun and flow at work? Suppose colleagues within a team share what their strengths are, in which type of environments they really come to fruition, what motivates them. Suppose teams would then organize the work so that the team members could do more of what really turns them on. What would that mean in terms of work pleasure and flow? What effects would this have on the team? The Wheel of Choice® is often used as an instrument to develop teams. It is an individual preparation for a team intervention focused on organisation of work, internal alignment, fun at work AND results. 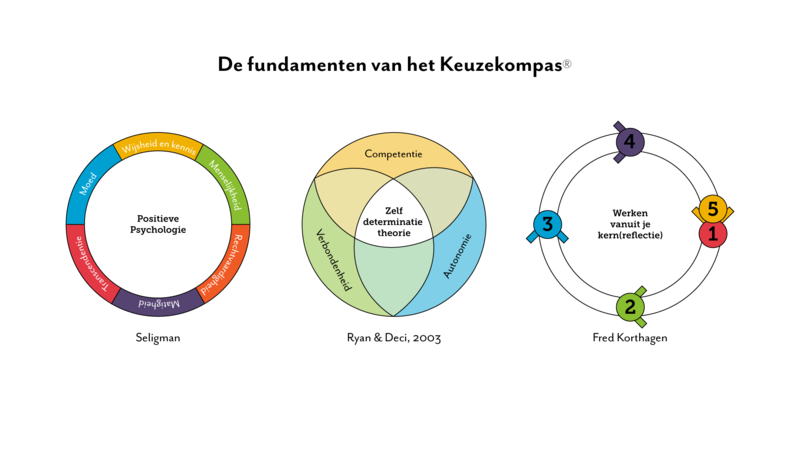 Do you want to get started with the Wheel of Choice ® in your organisation? Contact one of our coaches in your area. All our coaches are experienced in facilitating these organisation processes. Or leave you contact details by filling out the contact form. The method “Wheel for Choice” ® is a registered trade mark. It is the property of and managed by The Future Generation CVBA (www.thefuturegeneration.nu). The Wheel of Choice® is based on the scientific insights of Positive Psychology, Appreciative Inquiry, Core Power Coaching and the self-determination theory. The Wheel of Choice® is unique in Belgium! It is the first inside-out tool that helps people to order the things that really matter to them in their lifes when they are faced with important choices. The Future Generation CVBA collaborates with the university of Ghent, the department of Development Psychology, to refine the method further. Would you as a coach like to get start using this methodology? Please get in touch with elie.naudts@thefuturegeneration.nu to learn more about the possibilities to collaborate. Before you can start as a licensed Wheel of Choice® coach, we provide an intense training programme where you will learn how you can support individuals in their Wheel of Choice® process. During the training session, you will experience what it is like to go through the Wheel of Choice® process. This experience will help you to guide coachees in a more efficient manner. Welke weg wil je inslaan in je studies? Of na je studies? Of wil je eigelijk wel gaan studeren? Misschien toch eerder op zoek naar werk? Of naar het buitenland? Of waarom niet een eigen zaak beginnen? Maar… Wat wil jij zelf ? Wat wil je echt gaan doen? Met wie? Waarom? Welk pad maak je voor jezelf? Welke keuzes maak je? Wat zit er binnen in jou dat naar buiten wil komen ? Om het antwoord te vinden op al deze vragen, heb je een goed beeld nodig van jouw sterktes, jouw waarden, jouw dromen, jouw verlangens, jouw ambities, … Kortom, een sterk innerlijk kompas dat jou de richting aanwijst waarin jouw levenspad zich zou kunnen ontplooien. Laat dit kompas nu net iets zijn dat we niet sterk ontwikkeld hebben op school. Daar heb je misschien vaak gehoord waar je niet goed in bent en waar je aan moet werken. Maar waar ben je zo goed in dat dit misschien de rest van jouw leven zal vullen? Hoe ziet jouw levensproject eruit? Jouw Keuzekompas® helpt je bij het maken van al deze keuzes. Een geschenk voor het leven! Wil je zelf aan de slag om een eigen Keuzekompas® te maken? Contacteer één van onze coaches die actief is in jouw buurt. Als jonge adolescent nemen we veel sleutelbeslissingen die ons leven een bepaalde richting insturen. Vaak duiken een tiental jaren werk en volwassen leven later de eerste twijfels en frustraties op. De gevolgen van die keuzes worden dan voelbaar: ligt de job me wel? Leid ik het leven wel dat ik écht wil? Richt ik me niet téveel op mijn competenties in plaats van te kijken naar mijn interesses? Wie té ver afwijkt van zijn innerlijk kompas, kan in een existentiële crisis belanden. My Future Works is onze partner voor loopbaancoaching. De coaches van My future Works werken immers vanuit dezelfde kaders. Via www.myfutureworks.be vind je zeker een loopbaancoach bij jou in de buurt. -Wil je meer zelfsturing binnen jouw organisatie? Organisaties beseffen dat de “command & control” organisatiemodellen die gisteren nog efficiënt bleken, een rem zijn op toekomstige macro-economische uitdagingen. Daarom wordt er vandaag volop geëxperimenteerd met nieuwe organisatievormen, die vertrekken vanuit vertrouwen, loslaten, zelfsturing, enz. Als de duidelijke kaders wegvallen, moeten mensen echter kunnen terugvallen op een sterk innerlijk kompas, dat afgestemd wordt op het kompas van de organisatie. Laat dit innerlijk kompas nu net iets zijn dat we niet echt sterk hebben ontwikkeld tijdens onze opvoeding. Het Keuzekompas® vult die leemte in. Door ons bewust te zijn van onze sterktes, waarden, doelen en ambities, kunnen we beter navigeren in een zelfsturende en geconnecteerde wereld. -Wil je investeren in de veerkracht van jouw medewerkers? De complexiteit van onze organisaties en onze wereld maakt het werk er niet eenvoudiger op. Voor veel mensen raakt het vat stilaan vol, en loert stress en burn out om de hoek. De mate waarin mensen veerkrachtig omgaan met deze druk wordt mede bepaald door de mate waarin zij contact kunnen maken met hun intern kompas. Dit kompas helpt hen immers om keuzes te maken rond wat wel en wat niet heilzaam is voor hen, en om waar nodig grenzen te stellen. Het Keuzekompas® is het eerste instrument op de Belgische markt dat mensen helpt om op een bewuste manier keuzes te maken vanuit hun intern kompas. Het is dan ook uitermate geschikt als preventietool in stress- en burnout programma’s. -Welke keuzes wil je maken rond leren en ontwikkelen? Leren en ontwikkelen zijn de kern van wendbare organisaties. Het Keuzekompas® helpt jouw medewerkers om een duurzaam persoonlijk ontwikkelingsplan te maken dat aansluit bij hun sterktes, hun waarden en ambities. Het geeft aan welke zuurstof nodig is om hun potentieel te ontwikkelen tot op Olympische hoogte. Het maakt de jaarlijkse functioneringsgesprekken zoveel rijker, omdat de leer- en ontwikkelpistes die daar besproken worden, van binnenuit komen. -Waarom doen mensen de dingen die ze doen? Hoe komt het dat sommige mensen fluitend naar het werk gaan, terwijl anderen de minuten aftellen en zich om 17:00u naar de prikklok reppen ? Wat is het verschil tussen motivatie en moetivatie ? Doen mensen een job die aansluit bij hun persoonlijke ambities, dromen en verlangens, of doen zij enkel de dingen “omdat het moet “? Het Keuzekompas® legt de kern van persoonlijke motivatie bloot. Waarom doen mensen de dingen die ze doen ? Wanneer we het daarover kunnen hebben krijgt het werk plots een ander perspectief. Wanneer we in dialoog gaan over wat ons écht beweegt, ontstaan er authentieke verbindingen tussen mensen, waarbij we samen bouwen aan een gemeenschappelijk doel waar we met z’n allen in geloven. -Wil je jouw teams en organisatie bouwen rond werkplezier en flow? Stel dat collega’s binnen een team met elkaar zouden delen welke hun sterktes zijn, in welke omgevingen zij echt tot bloei komen, wat hen motiveert en bezighoudt. Stel dat de teams vervolgens het werk zo zouden organiseren dat de teamleden méér konden doen van waar ze echt warm van worden. Wat zou dat betekenen voor werkplezier en flow ? Wat zou het effect zijn op de resultaten van het team ? Het Keuzekompas® wordt vaak ingezet als teamontwikkelingsinstrument. Het is een ideale individuele voorbereiding voor een teaminterventie die gefocust is op werkorganisatie, interne afstemming, werkplezier én resultaten. Wil je binnen jouw organisatie aan de slag met het Keuzekompas®? Contacteer één van onze coaches in jouw regio die actief en beslagen is in het begeleiden van bedrijfstrajecten. Of laat jouw contactgegevens na via het contactformulier. De methodiek ‘Keuzekompas’® is een gedeponeerd merk. Het is eigendom en wordt beheerd door The Future Generation CVBA (www.thefuturegeneration.nu). Het Keuzekompas® is gebaseerd op de wetenschappelijke inzichten van de Positieve Psychologie, Appreciative Inquiry, Krachtgericht Coachen en de Zelfdeterminatietheorie. Het Keuzekompas® is uniek in België! Het is de eerste inside-out tool die mensen helpt om die dingen, die er voor hen echt toe doen, op een rijtje te zetten wanneer belangrijke levenskeuzes zich aandienen. The Future Generation CVBA werkt samen met de Universiteit Gent, faculteit Ontwikkelingspsychologie, om de methodiek verder te verfijnen. Wil je als coach graag met deze methodiek aan de slag? Informeer naar onze samenwerkingsmodaliteiten via: elie.naudts@thefuturegeneration.nu. Vooraleer je als licentiehouder van het Keuzekompas® aan de slag gaat, voorzien we een intensieve opleiding waarin je alles leert over hoe je individuen concreet kunt ondersteunen in hun Keuzekompas®-traject. Je ervaart tijdens de opleiding wat het is om zelf een Keuzekompas® traject te doorlopen. Door deze ervaraing zal je beter in staat zijn coachees op weg te helpen.